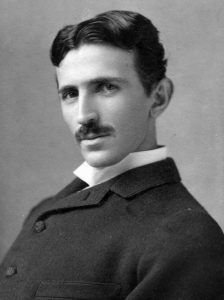 One famous legend surrounding the eccentric Tesla was that he had an earthquake machine in his Manhattan laboratory that shook his building and nearly brought down the neighborhood during experiments. 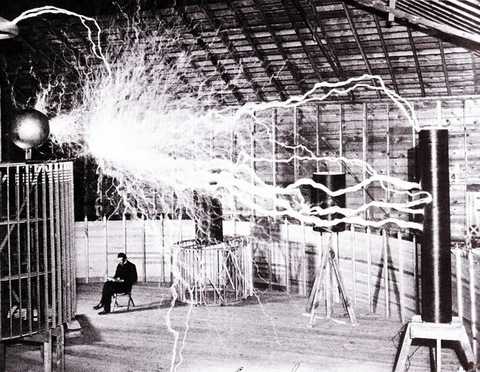 Tesla’s device wasn’t actually an earthquake machine, Carlson said, but a high frequency oscillator. A piston set underneath a platform in the laboratory shook violently as it moved, another experiment in more efficient electricity. People aren’t aware that he was close friends with conservationist John Muir, Seifer said. Muir, one of the founders of the Sierra Club, loved that Tesla’s hydroelectric power system was a clean energy system. It runs on waterfalls, which Tesla referred to as “running on the wheelwork of nature.” Also among his friends: financiers Henry Clay Frick and Thomas Fortune Ryan. “He lived in the Waldorf Astoria, at the height of the gilded age,” Seifer said, adding that his fame later in life lessened. Left: Futurist Nikola Tesla, seen here at age 34 in 1890, is the inventor of the Tesla coil and alternating current machinery. Photo courtesy Wikimedia Commons.